Chef Adrian has been with the Red Lion for over 3 years now. Originally from Kenya, he has been classically trained in culinary arts as both a pastry chef and as a butcher. 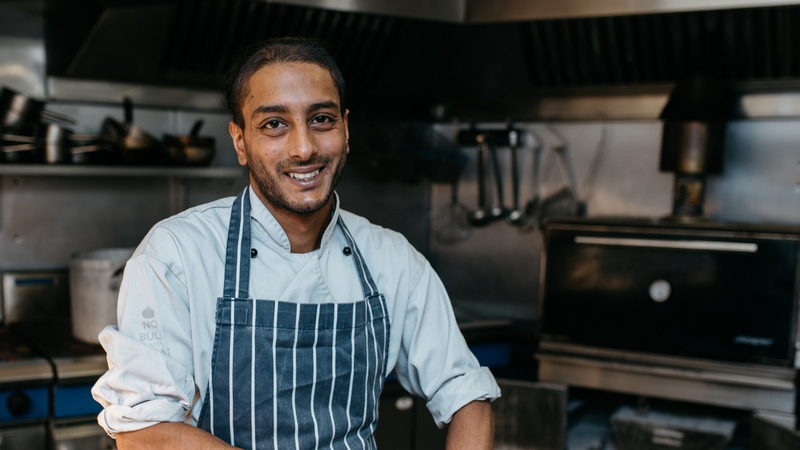 Currently, Chef Adrian serves as our Executive Chef keeping the kitchen running as smoothly as possible, overseeing our team of five kitchen staff, and most importantly, making sure all the food served at the Red Lion meets the best quality of taste and presentation standards for you, our Guests! The following is a list of tips Chef Adrian offers for making the perfect Sunday Roast. There is meat for every budget. Maybe you want a nice roast chicken or turkey crown, some succulent lamb chops, or something like the Red Lion’s 28-day dry aged steaks. Either way, I highly recommend buying your meat from quality local sourced meat purveyors. One of the benefits of living in the countryside is the availability of farm fresh lamb, beef, and pork. The fresher the better. And if you have to buy from the local supermarket, then I always buy British meats. If for nothing else, I know it travelled the shortest distance from farm to table. Also, try to buy your meats fresh and never frozen. One of the questions I get asked a lot is how do you get them so crisp? For some this is no secret but what I always do is use fat. Goose fat is a preferred way of getting your Roasties nice and crisp in the oven. However, you can always use butter. Make sure to add salt and pepper as the salt will help draw out the moisture. And don’t over do it with the fat or butter as you don’t want to drown your potatoes. If you are a vegetarian or health conscience and do not want to use the goose fat or butter, then try substituting the animal product for a good extra virgin olive oil, margarine, or even try coconut oil for something different. They are not that hard to make, if you have the time. And if you don’t have the time, then buy a powdered mix you make fresh that day. Sure it’s easy to buy the frozen ones from the supermarkets, but is that really how you want your Sunday Roast? You may have to make choices because of your budget or time, but nothing compares to a thick meaty gravy, done from the roast meat juice, wine, and butter. It’s not hard to do. Just use the pan drippings for the tastiest gravy every. And always keep a little bit of corn starch or flour on hand in case you have to thicken it up and you don’t have time to make a proper reduction. In fact, you can even cook them in the same roasting pan if you don’t have too many people to cook for. Follow the same directions as the Roasties and season to taste. I prefer fresh Thyme and Rosemary but that can depend on what meats I am cooking for what your personal preference is. When in doubt, just use the freshest herbs and vegetables you can find. Either way you can’t go wrong. This can be just as important as the food itself. Everyone knows what they like to drink. Red Wine, Prosecco, Beer, or why not try something new? Ask Richard if you are having trouble with pairing the right wine or beer with your meal. We just want your experience to be the best possible. I look forward to seeing you all for Sunday Roast at the Red Lion Hunningham. Just make sure to Book Your Table in advance to make sure you have a seat. And if you are cooking at home, I hope these tips help you make a delicious Sunday Roast. Book a Table for your Sunday Roast online now!